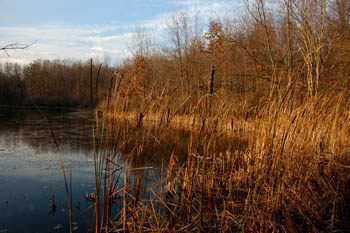 Metamora-Hadley Recreation Area is a 723-acre state park in the southwest corner of Lapeer County whose main feature is Lake Minnawanna, an 80-acre impoundment. Surrounding the lake and developed areas of the park is a rolling terrain that ranges from heavily wooded ridges and open fields to wetlands and is laced by almost 5 miles of trails. Metamora-Hadley is a lightly used park whose busiest period is a series of Halloween-Harvest Festival staged on most October weekends for campers. The same holds true for its trail system. Arrive in the middle of the week and you’ll probably encounter only a handful of other hikers. The trails attract few skiers in the winter as they are not groomed while mountain biking is prohibited. In the mid-1980s a Girl Scout troop set up a mile-long self-guided nature trail with 13 numbered posts scattered from the main trailhead to the south campground loop. You can still see many of the posts today but the accompanying brochure hasn’t been offered in years. 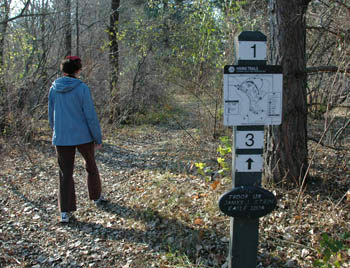 Collectively the trails are referred to as the Metamora-Hadley Nature Trails and do feature a series of interpretive plaques focusing on natural history and tree identification. 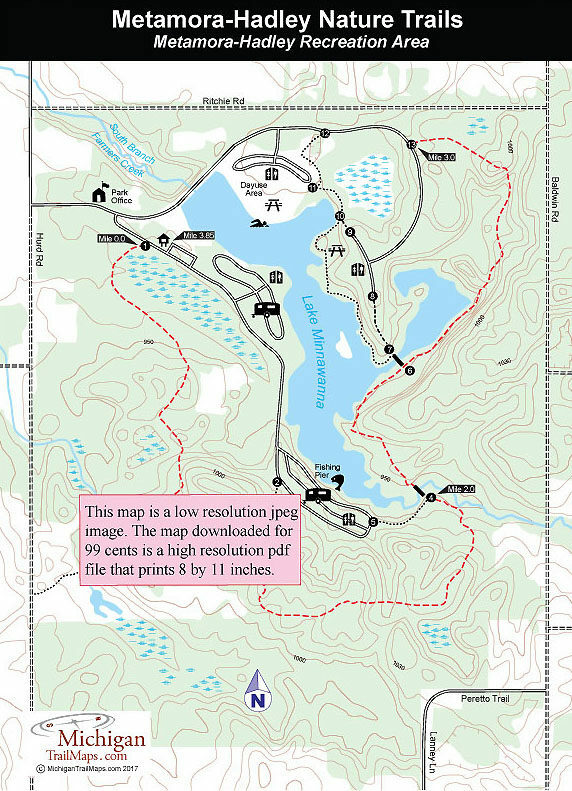 The perimeter of the system plus a portion along the park road that returns you to your vehicle is only a hike of 3.85 miles and is described below. For even a shorter, 1.2-mile loop begin at post No. 11 in the park’s day-use area. Hike to the foot bridge at post No. 7 and once on the other side loop back to your vehicle via posts No. 6, 13 and 12. There are numerous unofficial paths in the area but most of them have been blocked off with small wooden barriers and overall the trail is well posted and easy to follow. Some stretches along Lake Minnawanna are scenic but in general this is a stroll through woods and fields. Even without grand scenery Metamora-Hadley can still be a pleasant escape that will sooth the soul at the end of a hectic week. The main trailhead, post No. 1, is along the park road and reached just before the first campground loop. There is a small parking area across the road. The trail heads south in the woods but immediately begins skirting a large wetland area that can be scenic in the fall and noisy in the spring. Within a half mile you pass beneath a utility line where the trail is well posted. The hike through the woods can be pleasant but in less than a mile you enter an open meadow and climb a small rise where trail signs direct you to head east (left) for post No. 4. You quickly re-enter the woods, pass a “Scenic Trail” sign marking the spur to the south campground loop and then skirt the boundary of the park where a series of impressive homes will be seen through the trees. Lucky are those who can live on the edge of a state park and have woods and wetlands as their backyard. The trail leaves the homes behind, swings north and soon is skirting a ravine where below is the South Branch of Farmers Creek. You pass a huge American beech tree that is marked along the trail and then at Mile 2 arrive at post no. 4. To the west (left) is a trail to the campground and post No. 5. To the north (right) is the foot bridge over Farmers Creek. On the other side of the creek is the trail’s most scenic stretch as you follow a low bluff that allows you to view the south end Lake Minnawanna. The trail descends to post No. 6, reached at Mile 2.4, that marks a foot bridge leading to the day-use area. You continue northeast to skirt the marshy east arm of the lake. Eventually the trail swings away from the lake entirely, climbs a pair of hills, the steepest climbs of the day, and then descends to breakout at the park road at Mile 3.3. Head right on the paved road to return to the main trailhead and your vehicle at Mile 3.85. Along the way you pass post No. 12 that marks the spur to the park’s swimming beach. Metamora-Hadley features one of the most delightful state park campgrounds in southeast Michigan. The modern facility has 214 lightly shaded sites on two loops along the west side of the lake. A number of sites along the north loop are right on the shoreline and are usually the first to be selected by campers. Equally scenic, however, is the south loop where many sites are on a bluff overlooking the lake. Along modern bathroom and shower facilities in each loop and a sanitation station for recreational vehicles between them, the campground also has a camper cabin and two mini-cabins available for rent. At the north end of the lake is a beach with a marked swimming area, a bathhouse, picnic tables and a concession building that rents canoes, rowboats and paddleboats daily from May through mid-September. On the east side of the lake, in a wooded setting, is the park's picnic area along with a shelter. Metamora-Hadley Recreation Area is open year round and a vehicle permit or annual state park pass is required to enter the park. The entrance to the park is Hurd Road, which is reached from Pratt Road 1.5 miles west of M-24 or 2 miles from the village of Metamora. Call the park at (810) 797-4439. For a campsite or cabin reservation contact Michigan State Park Central Reservations (800-447-2757; www.midnrreservations.com).